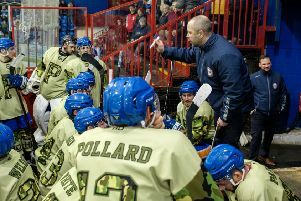 Assistant coach Jason Buckman insists Phantoms are capable of bouncing back from their most disappointing weekend of the season in arguably their toughest two days so far. The city team are licking their wounds after suffering back-to-back losses last Saturday and Sunday. They slipped to a second successive home defeat in NIHL Division One South when going down 2-1 after penalties to Milton Keynes Thunder and were on the receiving end of the same scoreline in regulation time the following night when beaten 2-1 in Hull in their latest NIHL National Cup outing. Now Phantoms face the challenge of correcting their nosedive in form when facing two of the strongest sides at second-tier level. They entertain Basingstoke on Saturday in an NIHL Autumn Cup clash (7pm) and while both teams are already assured of qualification for the semi-finals from Group 1, a terrific contest is in prospect. That is followed by a Sunday (6pm) trip to Bracknell for a top-of-the-table league showdown. Phantoms sit one point clear of the Bees at the summit, but have played a game more. “We need to bounce back,” admitted Buckman. “We don’t want to lose three on the bounce – and we certainly don’t want to lose three home games in a row. “There are a few little gremlins to iron out, but we’re certainly not pushing any panic buttons. “We have the chance to send a message out for the league as well as the cup if we can beat Basingstoke. “We know what to expect from them. They are a hard fore-checking team and we know what it takes to beat them. And Phantoms’ trip to Bracknell looks to have fallen at a good time as the Bees are currently without import Frantisek Bakrlik. The Czech forward is the leading points-scorer in NIHL Division One South after racking up 20 goals and 13 assists in 11 appearances, but he is currently serving a six-game suspension for an incident in a recent game against Invicta which left an opponent unconscious. Phantoms won 4-2 when entertaining Bracknell at Planet Ice in their opening game of the season. That is the Berkshire side’s only league loss to date. “Bakrlik is one of the best players in the league,” continued Buckman. “He scores around 50 per cent of Bracknell’s points and brings so much to the team. “It’s a big boost for us to be facing them at a time when he is not playing. They are title contenders and we have to pick up points against them. “It was a tight game when we met at our rink and Bracknell is never an easy place to go and play.